Pierre Lassonde revolutionized investing with the creation of the first gold royalty company. Three decades later, he is as confident in this model as ever, especially considering the difficulties of the majors in discovering large, high-grade reserves. In this interview with The Gold Report, this director and former chairman of the World Gold Council discusses the significance of the shift in gold ownership from West to East, the problem of mining scale and the results of the industry’s failure to develop new prospecting technology. 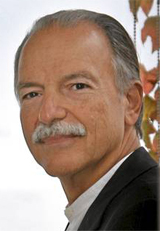 Lassonde is a director of the World Gold Council and was its chairman from 2005 to 2009. He is the co-founder and chairman of Franco-Nevada Corp. and was formerly President of Newmont Mining Corp. Designated a Professional Engineer by the Association of Profession Engineers of Ontario and a CFA by the University of Virginia, he was granted a Bachelor of Science by Ecole Polytechnic of Montreal and a Master of Business Administration by the University of Utah. Author of “The Gold Book: The Complete Investment Guide to Precious Metals” and a noted philanthropist, Lassonde is a member of the Canadian Mining Hall of Fame and the Order of Canada. The Gold Report: You wrote “The Gold Book: The Complete Investment Guide to Precious Metals” in 1990. What have been the biggest changes in gold investment since then? Pierre Lassonde: The first biggest change is the development of gold exchange-traded funds (ETFs). They began in 2004 and went from zero all the way up to over 2,650 tons of gold. Ownership is now down about one-third, but that’s still about 1,750 tons of gold held by this instrument. The second biggest change is the rise of the royalty companies. Franco-Nevada Corp. (FNV:TSX; FNV:NYSE) started as a royalty company in 1985. Royal Gold Inc. (RGLD:NASDAQ; RGL:TSX) started about 10 years later. Silver Wheaton Corp. (SLW:TSX; SLW:NYSE) started in the early 2000s. These companies combined have gone from zero to well over $20 billion ($20B) of market cap today; at their peak they were around $30B. The third major change is the astounding decoupling of gold equities from the gold price. The latter went from $250 per ounce ($250/oz) in 2001 to just over $1,900/oz in 2011. In turn, the gold equities rose, but nowhere near the percentage the gold price did. This decoupling has hurt gold producers tremendously. TGR: Some argue that ETFs are responsible for this decoupling because they allow people to invest in gold without buying physical bullion or gold mining shares. Do you agree? PL: Not at all. In the 1970s, after the gold price went up, earnings and dividends went up, as did the shares of gold equities. The margin expansion that enabled this has disappeared. This is 90% of the reason gold equities have decoupled. It is a self-inflicted wound and nothing to do with gold ETFs. 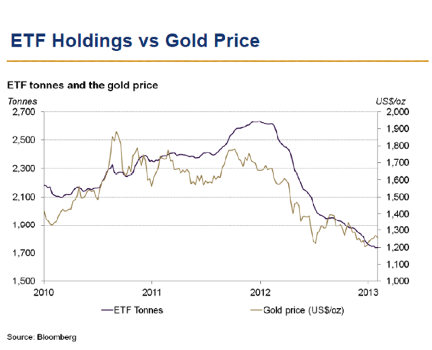 TGR: Some people deprecate gold ETFs as paper gold, arguing that it has the same problems as fiat currency. How do you respond? PL: I can speak only to the SPDR Gold Shares ETF (GLD:NYSE), the instrument created by the World Gold Council (WGC). I was very much involved in its creation. 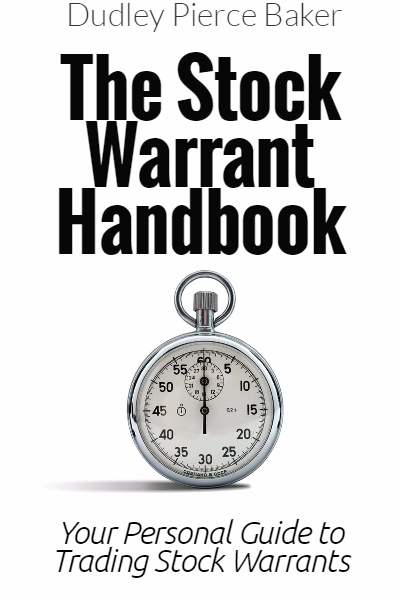 The documents that established it state clearly that every ounce of gold bought on the New York Stock Exchange (NYSE) must be backed by an ounce of physical gold. I have been in the vaults of HSBC in London and seen the $60B in gold there. As far as the SPDR Gold Shares ETF is concerned, these claims of “paper gold” are complete fantasy. SPDR Gold Shares is physical gold. It trades on the NSYE to make it easy for people to buy and sell. Before ETFs, it was very difficult to buy gold and selling was an ordeal. TGR: When gold topped $1,900/oz in September 2011, many goldbugs believed that, based on macroeconomic considerations, the price would top $3,000/oz and beyond. Was that view wrong, overstated or ahead of its time? PL: It was clearly wrong when we look at what happened. That view was based on the idea that the Federal Reserve was issuing so much paper that significant inflation would appear shortly, and that, in turn, would boost the gold price up and up and up. Three years later, we still don’t see any inflation. What these people forgot is that the velocity of money fell tremendously in 2008 and has never really recovered. The money being created by the Fed is being sat on by the banks. TGR: After the gold price collapsed last year, many quoted John Maynard Keynes’ assessment of gold as a “barbarous relic.” What do you make of that? PL: Tell that to the Indians and the Chinese who last year bought over 2,800 tons in physical gold, mostly for jewelry and gifting. The last 10 years has seen a huge gold transfer from the West to the East. People in the West look at Western statistics and argue that the price of gold must collapse. They forget we are no longer the No. 1 market in gold in the world. Chindia is: China and India. Those are the No. 1 and No. 2 gold markets in the world. 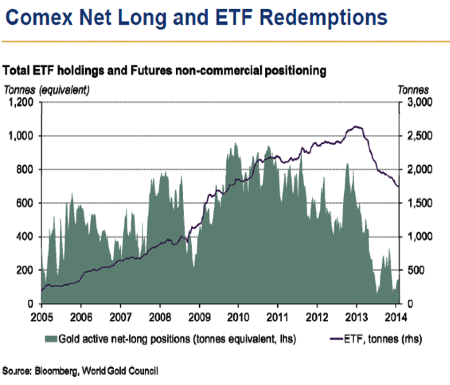 Last year, we saw about 900 tons of gold come out of the ETFs. We saw 400 tons of gold come out of the COMEX. Goldman Sachs predicted that gold was going to $900/oz. But at $1,250/oz, the Chinese and the Indians stuck their hands out and said they would take it all. Gold then stabilized at $1,250/oz. TGR: You’re a director of the World Gold Council (WGC), which publishes research on global trends in the gold space. Which factors now control the price of gold? Where do you see its price going? PL: As I mentioned, the largest gold markets are China and India. China has 300–500 million people entering the middle class, which has a huge affinity for gold. The situation in India is similar. So the Chinese and Indians will determine the gold price. TGR: You said that you see the gold price going sideways. Short term or long term? PL: Short term, I think. We’re not seeing the kind of disgorgement from the ETFs and the COMEX that we had last year. Inventories are building up. In the short term, June and July are normally the two softest months of the year for the gold price. So we could retouch the lows of 2013. Going into fall 2014 and 2015, gold will be sideways to up but not dramatically so until inflation returns, and the U.S. dollar is effectively devalued. Asian demand for gold jewelry follows Economics 101. The higher the price, the less the demand; the lower the price, the greater the demand. So if gold goes to $1,800/oz, much demand will disappear, unless people are buying for financial reasons. TGR: As we know, China is not the most transparent jurisdiction in the world. Do we know how much gold the Chinese government has now? Can we make a good guess? PL: The only thing that we know for certain is that in 2009, the last time China reported its official central bank reserve to the International Monetary Fund, it had exactly 1,054 tonnes of gold. Many speculate that that number has increased since then. I would tend to agree, simply because we have seen a fairly big jump in the import statistics in the last couple of years. We know that China is the largest gold producer in the world. It produces over 400 tons of gold, but that gold has to be sold to the central bank, which then sells it back to the jewelers. I think that two or three years ago, the central bank started to keep home-produced gold and began importing gold to sell to the jewelry market. 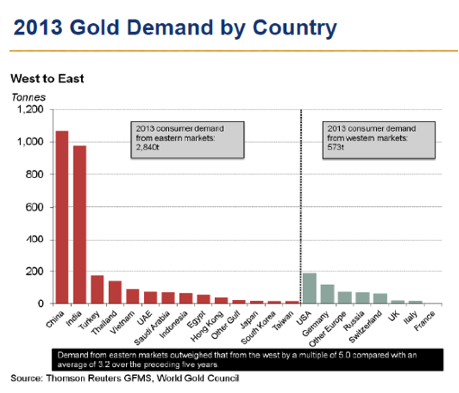 TGR: WGC figures suggest that personal gold buying in China will continue to increase over the next few years. PL: Gold demand in China has been related to the growth in gross domestic product (GDP). For more than a decade, each 1% growth in GDP resulted in 1.5% growth in the gold market. Last year, however, the growth was more like 2% or 2.5%. Much of that gold ended up as collateral in back-to-back loans, commodity loans. So gold is being used as a financial instrument, as well as for jewelry. TGR: Do you believe China seeks a dominant position in world bullion ownership? PL: Three points: First, the Chinese authorities very much encourage private gold ownership, for instance in TV ads. Second, 10 years down the road, the Shanghai Gold Exchange (SGE) is likely to determine the gold price, not the COMEX. Third, I have maintained for quite a few years that when we reach the peak in this gold cycle, the SGE will resemble a casino. The Chinese have a huge propensity for gambling, and this is what will likely propel the gold price to levels that we probably can’t even imagine. TGR: Highlighted by suspension of construction at Barrick Gold Corp.’s (ABX:TSX; ABX:NYSE) Pascua-Lama project in October 2013, the gold majors have acquired a reputation of being sluggish and unresponsive. Is this fair? PL: To some extent. I think the majors have a scale issue. A company like Barrick or Newmont Mining Corp. (NEM:NYSE) needs to replace 7 million ounces (7 Moz) of production a year, which means depletion of something closer to 8.5–9 Moz/year; looking at the exploration success of the last 15 years or the lack thereof, we see that the majors are going for lower-grade material because that’s what they can find. The majors are not replacing the Goldstrikes and the Hemlos, the high-quality mines of the 1980s and the 1990s. That said, I think that Goldcorp Inc. (G:TSX; GG:NYSE) has done a superb job of upgrading itself. It spins off projects that don’t meet its requirements; it makes money from them and keeps increasing the quality of its portfolio. Goldcorp is now producing 3 Moz gold annually. That’s far more manageable than 5–7 Moz/year. TGR: With regard to scale, what do you make of a possible merger of Barrick and Newmont? PL: I don’t believe in the synergies that are being touted. The mining industry is singularly without synergy simply because each mine is a different business. A silicone company can build one plant to replace five, because it’s the same product. Each gold mine is different. Some are open pit; others are underground. Each gold mine requires different equipment. They have different types of ore with different metallurgies. Gold mines are run independently. The only synergy is replacing a few dozen or few hundred accounting employees at the head office. Second, I can’t imagine how Barrick and Newmont are going to replace 14–15 Moz/year gold. We haven’t found a 15 Moz deposit in over 15 years. We haven’t found a 30+ Moz in well over 20 years. Barrick and Newmont have six projects that will peter out over the next decade. Those are incredibly difficult to replace. I just do not understand the logic behind a merger. TGR: Is the gold industry comparable to the oil industry, in that gold, like oil, has become ever more difficult and expensive to find and produce? PL: The big difference between the two industries is the use of technology. The oil industry has done a much better job than the mining industry with research and development and creating new technology. Look at three-dimensional (3-D) seismic. The oil industry went from 9 dry holes out of 10 to 7 successes out of 10 because of 3-D technology. We have none of that in the mining business. We’re still using the same technology we used 100 years ago. The oil industry developed fracking, a new technology that opened up vast new basins of tight oil. Then there are the deep waters where they come up with huge discoveries. The oil industry still has an enormous amount of great oil coming at $15–20/barrel. When you consider a market price of $100, the margins are quite unbelievable. Similar results have eluded the mining industry, and that’s why margins have not expanded. The gold price has risen 500%, but we still end up with $200/oz margins. TGR: You had kind words for Goldcorp. What do you think of Barrick’s prospects after its recent shift in management? PL: Barrick has a number of really excellent mines. I’ve worked my whole life with the 80/20 rule—80% of all your money comes from 20% of what you do. PL: Exactly. If you are the CEO of Barrick, you realize that five of your mines probably produce 80% of profit and earnings. So why would you want 23 mines? Barrick’s CEO could slim the company down, actually make a ton of money and have a much easier time with reserve replacement. There are things that can be done to make that company work far better than it has over the last decade. TGR: Do you think it’s moving in a positive direction? PL: I take a wait-and-see attitude. I’m a Doubting Thomas; you have to show me. 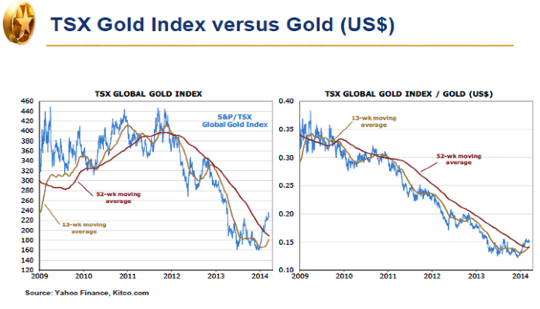 TGR: Do you think that the prices of the gold majors will be the first to move on higher gold prices? PL: Yes, if history repeats itself. The gold price went up from 1971 to 1974; then we had a 50% correction. From 1976 to 1980, gold went from $90/oz all the way up to $800/oz. From 1974 to 1976, the gold equities had a terrible time, losing over 50%. Then from 1976 gold equities made a big move upward, and the first movers were the bigger companies. The question today is whether the public will believe that the majors have reformed. TGR: The royalty model has grown in popularity as people look for safe ways to gain exposure to junior miners. How has this changed in the last 30 years? PL: I co-founded Franco-Nevada in 1982 and am now its chairman. Franco-Nevada invented, if you will, the royalty model. We were the first company to have a business model based on purchasing and creating royalties. It has worked incredibly well. The model has evolved to some extent. We explain the royalty model by pointing out that when investors buy gold ETFs, they must first of all pay others to hold their gold. So they are getting dinged 35 basis points a year for safety. When gold rises up 10%, investors get a 10% increase, minus the service charge. The royalty model, we say, is a gold ETF on steroids. When investors buy shares of Franco-Nevada or a similar company, they get so many ounces of gold but they also get, today, a 1.6% yield. So we pay investors to hold the share. At the same time, royalty company managements reinvest their money, so they have growth in the per-share value of the company. TGR: How have the benefits of the royalty model been demonstrated by the history of Franco-Nevada? PL: The original Franco listed at $0.35 a share. Every $1,000 invested in the company in 1982 became $1.2M in 2001 after the sale. That was about a 36% per year compounded rate of growth. The new Franco came out in 2008 at $15/share, and the stock today is trading around $53. That’s about a 21–22% compounded rate of return over the last six years. TGR: How do you rate your company’s prospects going forward? PL: They’re just as good as they’ve ever been. When times are really tough, as they are now, and we have over $1B in liquidity, we can put our balance sheet to work. We can buy and create royalties. And when times are really good, and mining companies can get all the equity financing they want, that’s also great for us because that money goes to explore the lands that we already have. The cycle is our friend. TGR: How would you rate the prospects of Royal Gold and Silver Wheaton? PL: Royal Gold was created by a friend of mine. If copying one’s business model is the highest form of flattery, well, he told me that’s what he did. It’s well managed and does quite well. It’s in gold but also in base metals. Silver Wheaton, as the name implies, is focused on silver. It has also done very well, but the silver space is smaller than the gold space. So at some point, I think that model will run out of runway. I would expect that company will eventually try to compete in the gold space. TGR: How do you rate the prospects of smaller royalty companies such as Gold Royalties Corp. (GRO:TSX.V) and Sandstorm Gold Ltd. (SSL:TSX; SAND:NYSE.MKT)? PL: The smaller companies all need to find a royalty that will anchor them. In the case of Franco-Nevada, it was Goldstrike, where the deposit went from 500,000 oz gold to now having produced 40 Moz gold. Until that anchor is found, it’s a really difficult business because the deals are small, and the payouts are very uncertain. As a result, I think many junior royalty companies will not survive. TGR: Are you seeing or do you expect to see high net worth and institutional investment returning to the large-cap gold space? PL: The short answer is yes. The question is when. Right now hedge funds and some high net-worth individuals who know the space are nibbling here and there. But if you look at the precious metals funds, one month there’s a bit of influx, and then the next month they lose money. They’ve been losing money for two years. We have not seen the public really come back into the stocks at all. Some of the institutions that have never been in gold are now kicking tires, looking at companies that lost the most last year. TGR: You’re a director of New Gold Inc. (NGD:TSX; NGD:NYSE.MKT). A year ago, you said, with regard to its Blackwater gold project in British Columbia, that there is a 50/50 chance it will become a 25 Moz camp. Are you as optimistic now as then? PL: I am. My only qualification is that thank goodness I didn’t say it will become a 25 Moz camp by 2014. Blackwater itself is a 10+ Moz system. The work we’ve done on our property in the last year, and it’s a huge area, has shown us that there are at least five other areas with very high geochemical anomalies and geophysicals. But we will have to do a lot of drilling before we can come up with the next 5 Moz or 10 Moz deposit. TGR: The decision by the Canadian federal government to reject for the second time Taseko Mines Ltd.’s (TKO:TSX; TGB:NYSE.MKT) New Prosperity mine cast a kind of a pall on mining development in British Columbia (B.C.). What’s your view on this? How does New Gold stand in this regard? PL: Natural resource development in B.C. is not a heck of a lot different than in Ontario. It depends on your relations with First Nations. New Gold developed the New Afton copper mine in B.C. after developing great relations with the First Nations peoples there. We’ve developed the same good relationships at Blackwater, as we have with the 10–12 First Nations at our Rainy River property in Ontario, which we bought from Rainy River Resources last year. The same rules apply to the oil, gas and pipeline companies. The oil and pipeline companies that are in trouble have terrible relationships with native people. A company in natural resources development in Canada today better have a great team of people who understands the rights and needs of First Nations and can build cooperative relationships so that everyone can profit. TGR: Pierre, thank you for your time and your insights. COMPANIES MENTIONED: BARRICK GOLD CORP. :FRANCO-NEVADA CORP. : GOLD ROYALTIES CORP. :GOLDCORP INC. : NEW GOLD INC. : NEWMONT MINING CORP. : ROYAL GOLD INC. : SANDSTORM GOLD LTD. : SILVER WHEATON CORP.
2) The following companies mentioned in the interview are sponsors of Streetwise Reports: None. Franco-Nevada Corp. and Goldcorp Inc are not affiliated with Streetwise Reports. Streetwise Reports does not accept stock in exchange for its services. 3) Pierre Lassonde: I own, or my family owns, shares of the following companies mentioned in this interview: Franco-Nevada Corp. and New Gold Inc. I personally am, or my family is, paid by the following companies mentioned in this interview: Franco-Nevada Corp. and New Gold Inc. My company has a financial relationship with the following companies mentioned in this interview: None. I was not paid by Streetwise Reports for participating in this interview. Comments and opinions expressed are my own comments and opinions. I had the opportunity to review the interview for accuracy as of the date of the interview and am responsible for the content of the interview.